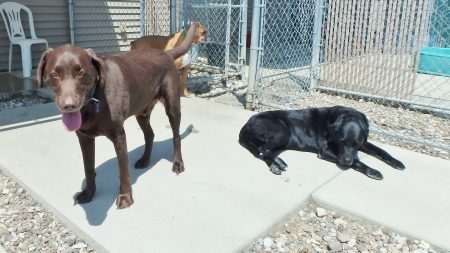 Welcome to Leo F, a chocolate lab, who came to JDPC for his first day of daycare last week! Leo had a lot of fun playing with his pals all day. As you can see here, they are all ready to take a break: Calvin B. (black lab) is ready for a nap, Duke Shr. (boxer) is taking in the breeze, and Leo is ready to join them. Welcome, Leo! You are a great addition to our pack!